Woodworm is a collective name given to a variety of wood boring insects which if left to their own devices without treatment can cause considerable damage to the structural timbers within a property. 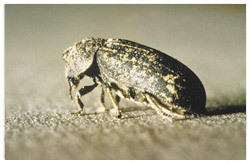 There are only two types of wood boring beetles that are significant in the central area of England these are the common furniture beetle and the Death Watch beetle. 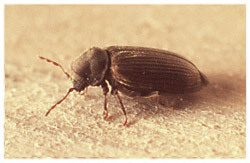 Common furniture beetle is fairly widespread and tends to attack soft woods whilst Death Watch beetle is more common in hard woods but they will normally be in damp situations. If your property is suffering from woodworm, please call us today for professional advice on how to effectively treat the problem. As woodworm can be present in roof timbers, suspended timber floors and sub floor areas it is essential for a trained surveyor to inspect accessible timbers to establish the extent of the infestation and make recommendations.